High school and film noir collide in Rian Johnson’s directorial debut. 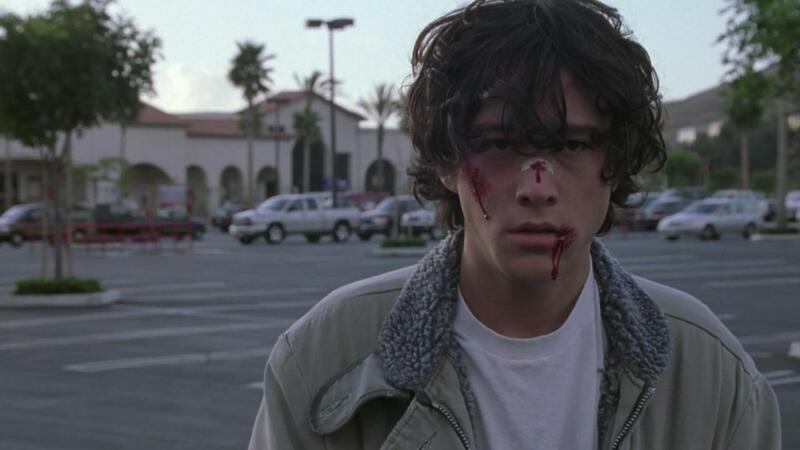 Joseph Gordon Levitt stars as loner Brendan who sets out to uncover what happened to his femme fatale ex-girlfriend when her body is found. Brick (2006) is a quirky indie that did very well at Sundance. Rian Johnson deftly uses a high school as the place to set his neo-noir opus. It borrows stylistically from the genre’s great writers like Dashiell Hammet, James M. Cain, or Raymond Chandler. But Johnson finds something unique in his stylised take on adolescence. Johnson’s movie then hails from a time long ago but the setting is very much in the present. Brick transposes the tone, the lingo, and the attitudes from classic detective fiction and roots it firmly in the present. It’s like kids playing a game, pretending, and it works very well. It’s in the tension between now and then that the film finds itself. It makes for an odd juxtaposition as contemporary characters are given lines like, “I got all five senses and I slept last night. That puts me six up on the lot of you.” These lines are delivered in a clipped manner, in a way befitting of numerous private eyes from black and white talkies from a lifetime ago. The trick then when it comes to watching Brick is to accept the tone, the concept, and the narrative. Genre bending isn’t that unusual a pursuit and borrowing, transposing, and using intertextual references provides a movie with a sense of context. Brick knows its influences and it wants you to appreciate them too. Brick is consciously riffing on a number of disparate concepts and ideas and it does so with a complete poker face. This isn’t a film that questions its lineage or seeks humour in its portrayal of high school neo-noir life. Instead the character’s all take it seriously and this seems to be all Rian Johnson asks for from his audience. This isn’t supposed to be funny, this isn’t a comedy, this is a microcosm of wider adult society and there are very real consequences for folks and their actions. Within this world lives Joseph Gordon Levitt’s Brendan. He’s an outcast, he doesn’t belong to any of the traditional high school cliques but he doesn’t need to. His character type comes with some specific tropes. He’s the Humphrey Bogart of Brick; he’s the rugged individual who will win out all by himself. In essence Brendan embodies past ideas of masculinity. In fact much of his story inhabits that of a classic 1930s private investigator as he attempts to find out what happened to his ex-girlfriend. His casework involves a lot of legwork as he traverses a high-school drug ring, threats of physical violence, and a principal that functions just like a police captain in a film noir. Brendan isn’t the only character that has film noir tropes imbued in his makeup. There’s the drug kingpin (Lukas Haas) who walks with a cane, there’s a number of beautiful girls, and there are everyday thugs for Brendan to combat. It’s a real journey for Brendan and one that has all of the requisite tropes that belong to the noir genre. There’s also the bookie/newspaper character who functions in Brick as the font of knowledge, the one that all of the gossip passes through. What’s interesting about Brick is the fact that the stylised noir tone never takes precedent over the story. Early film noir was a way of making movies, it had its own tropes and style, but it was still a narrative medium. Its purpose was to tell a story and its darker tone and imagery was a reflection of its place in time and history. Brick however is clearly designed to allude to the style of film noir and not simply to emulate it as a narrative form. Brick works as a story, in fact the noir-esque elements of the plot become less noticeable as the narrative becomes more involved. But Brick never strays from the formula that constitutes the make up of a noir piece. Rian Johnson deftly keeps the focus on the narrative whilst still leaning on Bricks’ stylistic choices. He turns the everyday high school kid into a hard-boiled, tight lipped character from a Raymond Chandler novel. Perhaps though the best thing about Brick is its promise. It showed that Rian Johnson was a director to keep an eye on, it made audience’s look forward to the director’s next work, and it was a promise that was fulfilled. Since Brick Johnson has directed The Brothers Bloom (2008) and Looper (2012). He also worked on three episodes of Breaking Bad (2008). Brick is a postmodern experiment. It blends setting with a disparate genre to create something new and unique. Joseph Gordon Levitt shines too ensuring that the film stands as a convincing neo-noir thriller.